Silvery white and lustrously bright, palladium 950 is a member of the precious platinum family. Resistant, hard-wearing, yet beautifully finished, this double groove patterned wedding ring blends classic style with contemporary edge. Band width measures 7mm. Palladium 950 7mm twin groove matt ring is rated 4.5 out of 5 by 2. 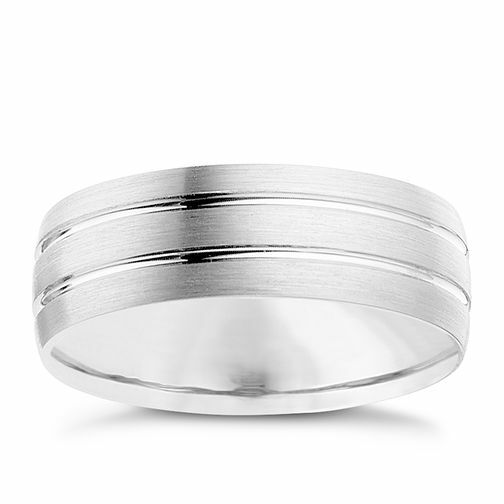 Rated 4 out of 5 by Anonymous from This ring does scratch I love this ring. The style is terrific, I like the fact it is thicker than most, as it suits my hand better. And I love that it shouldn't "yellow" over time the way a white gold one might. I thought it a good idea to invest in the Palladium on account of the durability, as it is of course something to keep! I was going to go for a cobalt ring as I know these are just as hard-wearing, but in the end I thought the Palladium options were slightly nicer and had a more up-market look. However, after a day of wear, I found the ring had been scratched. Since then, it has continued to acquire additional minor scuff marks and scratches. I took it back into 2 different EJ stores to ask about this, and I was told that despite Palladium's inherently hard properties, the matt/brushed finish will be prone to scratching (whilst a polished palladium ring would be much harder wearing). I'm not best pleased about this given the price tag! I can apparently have the ring re-finished, but clearly that's pointless since the same will undoubtedly happen again. The scratches thus far have been caused from day-to-day activities only, i.e. not any sort of manual labour or extreme sport. You should bear this in mind when deciding whether to part with such a large amount of money. Rated 5 out of 5 by Anonymous from A lovely ring. We chose this ring together, my fiancé wanted a darker coloured ring and a hard wearing one. It was comfortable and looked elegant and a little different to all the bog standard wedding bands. It completed my own ring perfectly which has diamonds on it, yet was still understated. We liked this ring as it was unusual and eye catching.